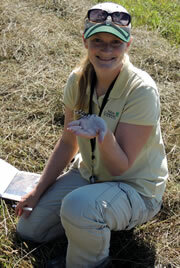 Kristyn Ferguson is the Nature Conservancy of Canada's (NCC's) program director for Central Ontarion – West. She joined NCC in September 2007. Kristyn is passionate about restoration, and especially committed to removing invasive species from significant natural landscapes. She is an outdoor enthusiast both at work and in her free time spending weekends hiking, cross-country skiing and backyard birding.